The earcups are mounted on three joints, so the headphones can swivel all over and remain comfortable on your head. They're very light for full-enclosure phones and they're comfortable. The headband also has a wide adjust range for DJs with huge heads. These phones are not particularly loud, which is fine for a quiet room, but may be a different story at the club, once you push the faders and cue the drunk people. They also lack depth on the lower end of the frequency spectrum. For under $80, these will get the job done. They make a great backup set for traveling DJs, soundmen or engineers. They are also very versatile for studio applications. For under $80, these will get the job done. They make a great backup set for traveling DJs, soundmen or engineers. They're also very versatile for studio applications. The MDR-V500s are not for the living room consumer. 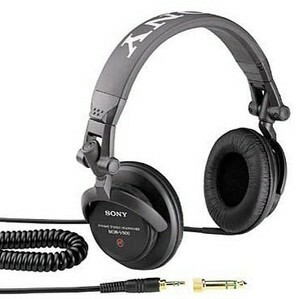 They are designed for the DJ, recording musician, live soundman and recording engineer. The most dominant feature of these phones is their flexibility. The earcups are suspended from the headband by three joints. The headband, itself, is widely adjustable to fit head sizes and different headphone positions. This allows the user to use one earcup at a time, called single-sided monitoring. This is an essential feature for live DJs. A coiled cord from the left earcup keeps the slack out of the user’s way. The terminal is a 1/8-inch jack with a 1/4-inch TRS adaptor. Like some other phones (Sennheiser HD280s, for instance), the adaptor screws onto the 1/8-inch jack, eliminating the need for friction plate components to hold the adaptor in place. This also means the adaptor can only be used by 1/8-inch jacks that use the screw-on system because regular jacks’ plastic surround won't fit. These aren't very loud headphones, which is both good and bad. It’s good because it'll cause less damage to your ears. It’s bad for live performances. When you’re trying to match a beat or cue a track, the ability to turn up the volume is paramount. The MDR-V500 can’t be pulled up beyond a certain limit, and that may not meet the needs of a performer in a loud environment. In controlled sound environments (like a studio’s live room), these phones may prove useful when multitracking with other musicians. Put one earcup behind your head, and you might be able to avoid having the other musician’s tracks in your phones. However, as a note for the recording engineer, the surrounds of these phones are soft and will bleed into your mics. In other words, these are not the phones to give to drummers while they track because you will have to blast the click track and it may show up on the room or snare mics. They won’t work for bassists, either, because they lack the bottom end. But they’re ideal for when the horn section records together. As for bottom end, try another set of headphones. The MDR-V500s are clear with low-mids, mids and highs, but they have no low frequency response. You can hear it, and at loud volumes (respectively) you can hear the kick and bass “pumping.” They’re not distorting, but definitely telling you they’re at their limits.